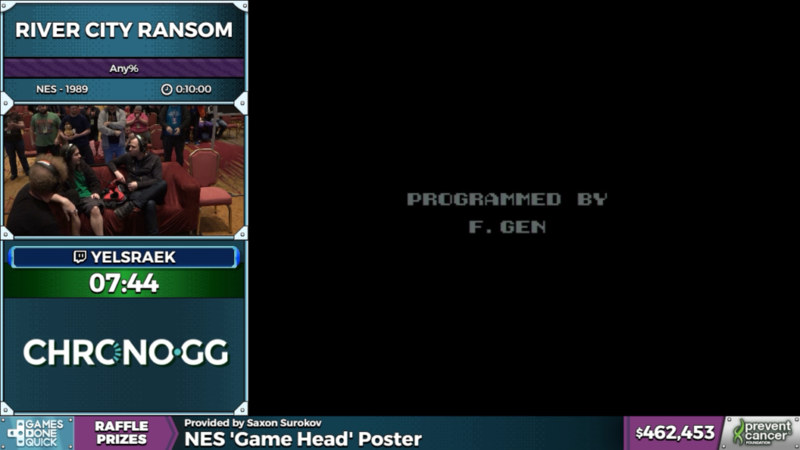 As we continue our AGDQ 2017 coverage, it’s time for more side scrolling beat ’em ups! 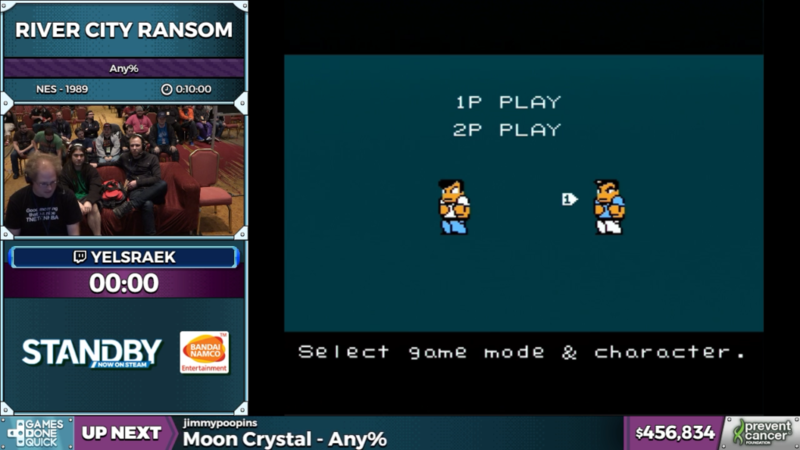 If you’ve never heard of River City Ransom, it’s the grand daddy of them all! Releasing in 1989, this open world fighting game breathed life into a new franchise, and paved the way for great arcade classics of the early 90’s. 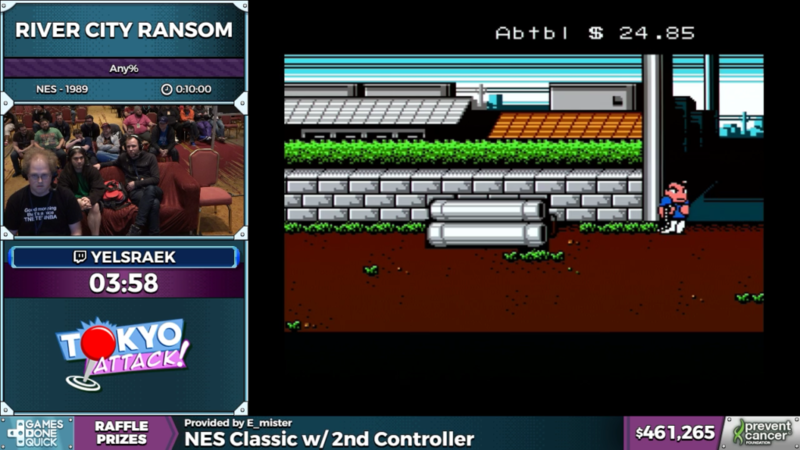 I recently finished River City Ransom: Tokyo for the 3DS, so it’ll be interesting to see yelsraek take on this NES classic. He plans on beating it in only 10 minutes, which will be quite a feat. It’s going to go quick, folks! After naming our hero, yelsraek gets set to destroy this childhood classic of mine. With that, we start our mission to save our girlfriend and collect some pocket change! Right at the start, yelsraek skips all the early fighting and rushes straight to the first boss. 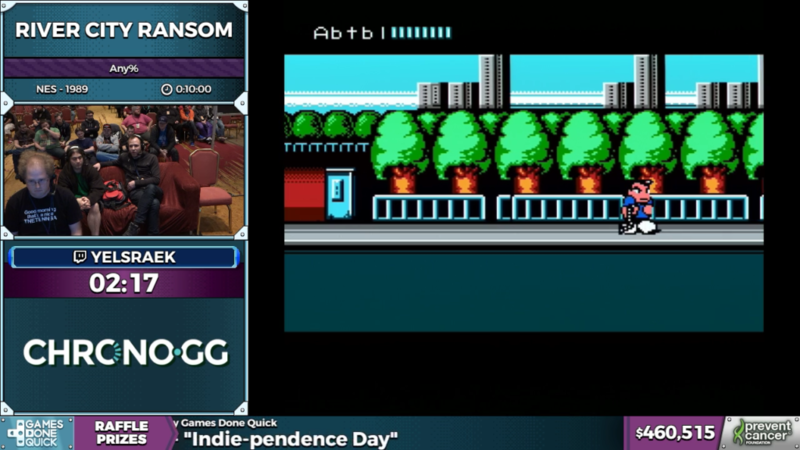 Enemies spawn randomly in River City Ransom, so yelsraek has to adjust on the fly to avoid taking any damage. There are different gangs of enemies that react differently though, so he has some sort of idea of what’s going on. As he enters the first boss fight, he picks up a box. He uses this against the first boss, Rocko. He briefly puts up some trouble, but he kills Rocko quickly. After defeating him, he kills himself intentionally, which warps him back to a checkpoint. This puts him very close to the second boss, whom he defeats quickly without tricks. The second boss drops a chain, which yelsraek will use for the next few bosses. His overall aim for the next few areas is to gain enough money to buy the item “Stone Hands”. He puts shame to the boss Mojo, and whips him with the chain. Right after, yelsraek buys “Stone Hands”, which teaches him a new attack. This new attack kills normal enemies in one hit, and inflicts a huge amount of damage on bosses. Using stone hands, Yelsraek takes out the boss Thor with ease. As yelsraek continues into the school, he takes out enemies with ease, but accidentally picks up a few weapons along the way. Picking up weapons prevents him from using the stone hands attack, which leads to a small loss of time. Then, yelsraek pulls off an awesome trick by executing a jump and a run at the same time, resulting in an extended jump. This puts him incredibly close to Cyndi, the girlfriend we’ve been trying to save this entire time. After rescuing her, yelsraek makes quick work of Simon, the last boss. Using stone hands to knock down Simon, yelsraek never lets him get up. 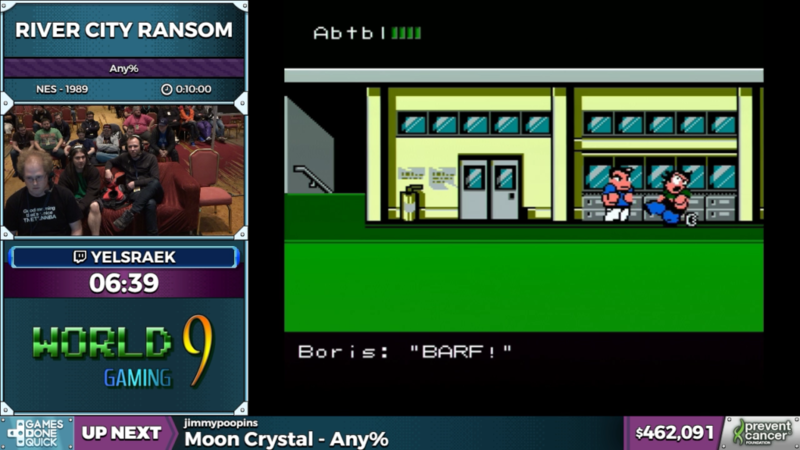 By pummeling Simon as soon as he gets up, yelsraek is able to keep him in a stun cycle until he runs out of health. 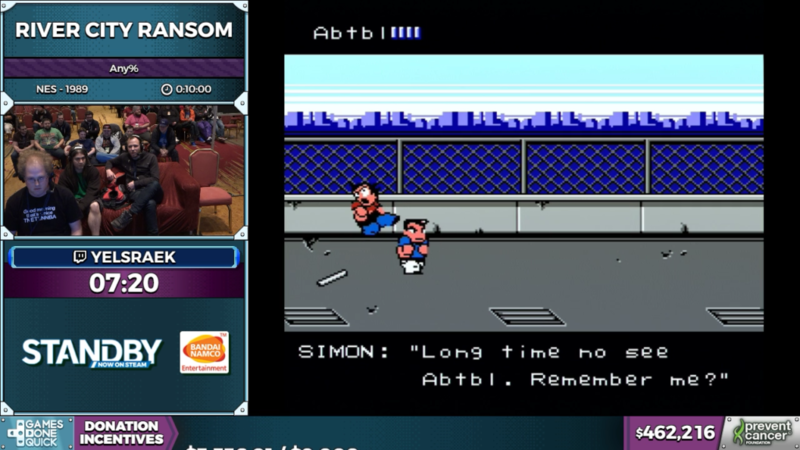 With one last stone hands attack, Simon breathes his last breath, and River City Ransom comes to a close.